What search keywords visitors used on your website’s internal search. Which of those keywords resulted in no results (and thus what content your visitors are looking for but cannot find). What pages visitors visited immediately after a search. What search categories visitors use (if your website employs search categories). 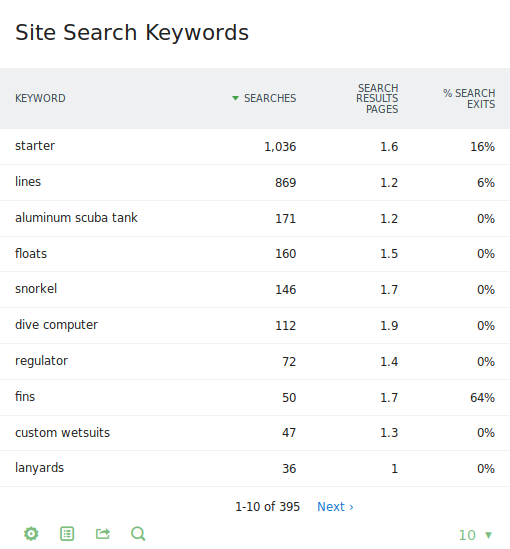 This page will walk you through the Site Search setup, how to track Keywords on your internal search engine, and which reports Matomo (Piwik) offers. To get started with Site Search tracking, login as the Super User or an Admin user and go to Administration > Websites. Here, you can enable or disable Site Search tracking for each of your websites. 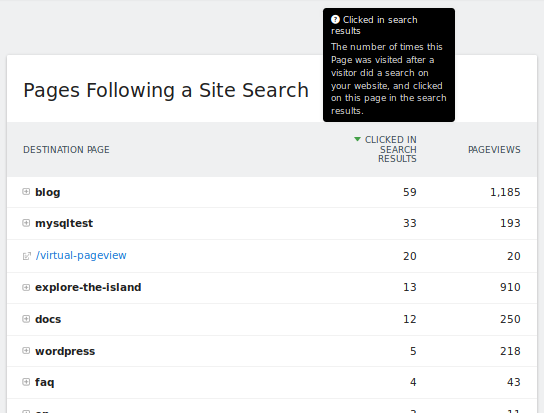 All Site Search reports are available under the main menu Actions > Site Search. The Super User can also specify the parameter names to use by default for all websites. Login as Super User, go to Administration > Websites, and look at the Site Search configuration at the bottom of the page. Advanced users can also record Site Search requests using the Matomo (Piwik) Tracking API. See more information in the Tracking API Reference page. Specifically, look for the parameters ‘search’, ‘search_cat’ and ‘search_count’. Would you like to benefit from the report “No Result Keywords”, listing all keywords that didn’t return any search result? Matomo (Piwik) will then track for the site search query, the number of results, and will report all keywords with “zero” results in the “No Result Keywords” report. 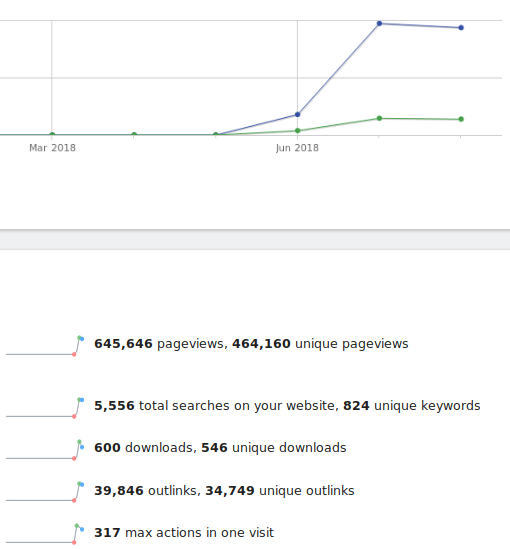 Under Visitors > Overview, the total number of Site Searches is reported alongside the total number of Pageviews, Downloads, Outlinks, Events, etc. The useful Transitions report will also show when Internal Search Keywords were used to reach the page being visualized. For example, in the screenshot below, you can see that there were five Internal Searches (on the left) that lead to the “/changelog” page (in the middle box). The searches were “changelog”, “add site”, “grouping” and “change servers”. It is useful to know which keywords visitors search for to find a particular page. If, for example, you notice many people search for a particular page, perhaps that page is more important than you realize and could be showcased more clearly. Tracking how people search your website is an easy way to find out exactly what your visitors want from you and your website. 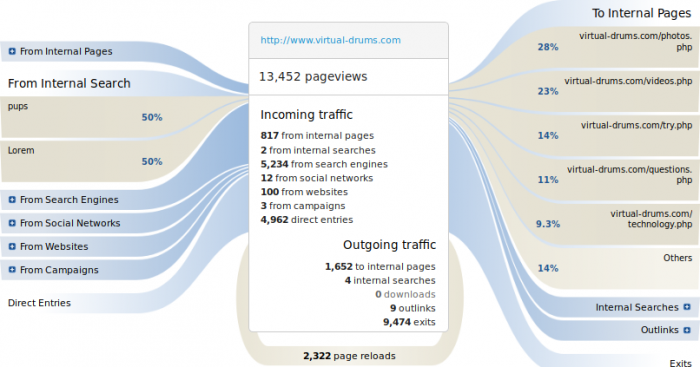 Happy Site Search Analytics with Matomo (Piwik)!